If you’re redesigning your kitchen, take time to think through what you’re looking for and the styles and finishes that appeal most to you. Your decisions will impact your living space for years to come. Though trends come and go, it’s likely they’ll have an influence on your choices in appliance style and finish. And since you’re going to live with your kitchen and its appliances for several years, it helps to look down the line to think about not just what’s hot now, but what elements of your kitchen design and appliances have worked well for you, and what you’ll be happy with in the long term. Those planning a redesign or remodel of a kitchen or those likely to purchase new appliances this year will want to read this. We spoke with three designers to get their predictions on the kitchen appliance trends that will dominate in 2018. Here’s what they had to say. Wine chillers: People who are remodeling tend to enjoy their wine, but some more than others. Busse estimates about 70 percent of her clients who are remodeling their kitchens install some sort of wine refrigerator, often an under-cabinet model. “It’s normally about 24 inches wide, 24 inches deep,” Busse says. “It has the dual zones.” The client’s love of wine plays into the size of their wine chiller. Those that have the space and know their wine might install a full-sized wine chiller that’s about the same size as a regular refrigerator, Busse says. Flat fridges: Homeowners are showing a preference for integrated refrigerators, Busse says. “When they’re closed, they’re really flat and in line with the cabinetry,” she says. “We see people buying stainless or paneling the refrigerator.” If a client goes for a black stainless refrigerator, they tend to get all their appliances in black stainless. More burners, more ovens: Consumers want to be ready for any kind of cooking or entertaining situation, and they’re designing their kitchens with that in mind, Willis says. “Buy the largest cooktop your space can accommodate,” Willis says. “Five to six burners is ideal.” Second ovens are also popular, regardless of whether the homeowner is a serious cook. “Even if it’s not an everyday need for the homeowner, it’s a great resale feature,” Willis says. Induction is also gaining popularity as consumers look to shorten the time they spend cooking. 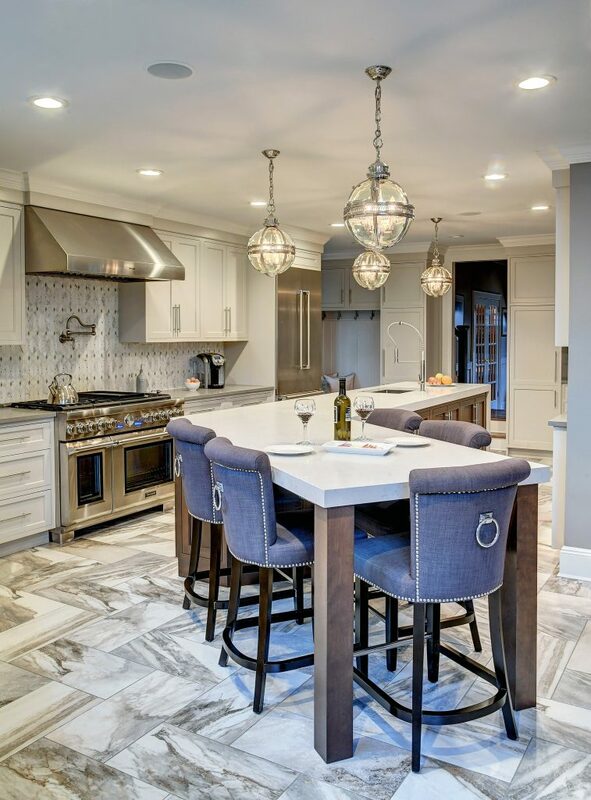 Commercial goes residential: Recent trends have residential kitchens incorporating elements that used to be the domain of commercial kitchens, Willis says. “Basically, you need two ovens. If you entertain, you want a warming drawer and at least two ovens. Maybe one can be a combination microwave/convection steam unit. Your stove top might not just be a cooktop, it could also be a grill. Many homeowners are also incorporating coffee stations. Cool cooling: Homeowners are looking for additional cooling appliances beyond the traditional refrigerator and freezer. Kitchens, Willis says, are being designed in “zones.” “If you have kids, they might have their own zone—a pull-out refrigerator for water, soft drinks, or yogurt. I think you’ll need an entertainment zone, where you’ll have space for the wine chiller and beverages. It could be a second area for the overflow that maybe your refrigerator can’t accommodate. Technology: Expect charging stations to become a regular feature of new kitchens. And while consumers are interested in smart technology, it will also require them to incorporate new habits to take advantage of the new features.